But you'll need to wait for Blue Mages. 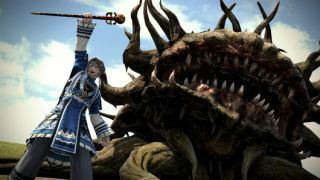 Final Fantasy 14’s A Requiem for Heroes update is out today, which can only mean one thing: it’s massive MMO patch notes time! I know that 4.5 is a rather meaty update, because I’m still scrolling through these patch notes right now. They never end. The next expansion will be out when I’m finally done. There are new main scenario quests, new job quests for the Blue Mage (due out next week when the job arrives), new crafting items, housing changes (new aquarium fish! ), a new dungeon and mahjong has been added to the Gold Saucer. Blue Mages are probably the most notable of the new additions, though they’re not set to appear until next week. It’s a limited job that can be played from 1 to 50, can’t play through the main scenario and is generally designed for solo shenanigans, though they can join premade or undersized parties. The new job’s big trick is learning spells from defeated enemies. If you see an enemy perform a special attack, you might be able to get the ability for yourself once you knock it out. Blue Mages also get access to an exclusive duty, the Masked Carnivale, that serves as a challenge mode made up of 25 stages. Here are the full patch notes, if you’ve got a free afternoon.